Today's term: Secondary Headache Disorder. Secondary Headache Disorder: headache caused by another illness or disorder. Cervicogenic headache is an example of a Secondary Headache Disorder. 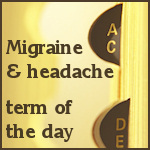 _Cervicogenic Headache - The Basicsor more terms, see our Migraine and Headache Glossary.